Queen Victoria’s court physician Sir William Withey Gull is credited as the first person to record the clinical features of hypothyroidism in adults in his 1873 seminal paper. Gull attributed these features to atrophy of the thyroid gland. In October 1873, Gull presented before the Clinical Society of London five cases of what he described as “a cretinoid state supervening in adult life in women”. Over the next years after Gull’s presentation to the Clinical Society of London, physician W.M. Ord noted five cases under his care of a similar kind, in one of which he had the opportunity to make a post-mortem examination. 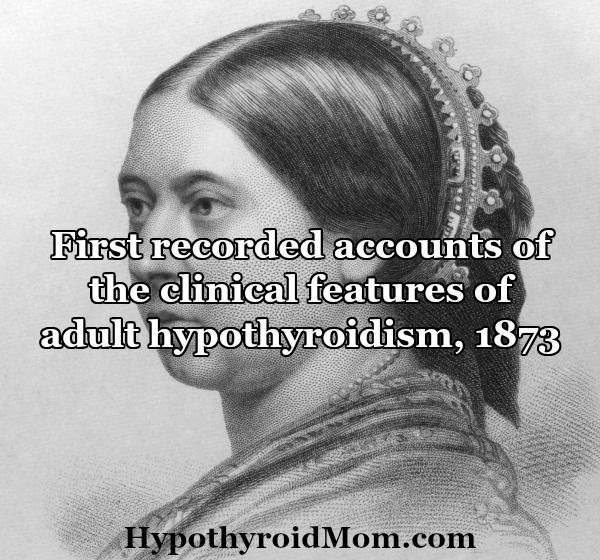 The medical term “hypothyroidism” did not exist at that time and it wasn’t until 1878 that Ord coined the term “myxoedema” in his paper “On Myxoedema, a term proposed to be applied to an essential condition in the “Cretinoid” Affection occasionally observed in Middle-Aged Women”. What we now call “hypothyroidism” was originally named myxoedema or myxedema (myx meaning “mucus” & edema meaning “swelling” from ancient Greek). Ord’s 1878 groundbreaking paper included the very first photo of a patient with myxoedema (“hypothyroidism”). H.B. was a patient of the Royal Medical and Chirurgical Society of London. 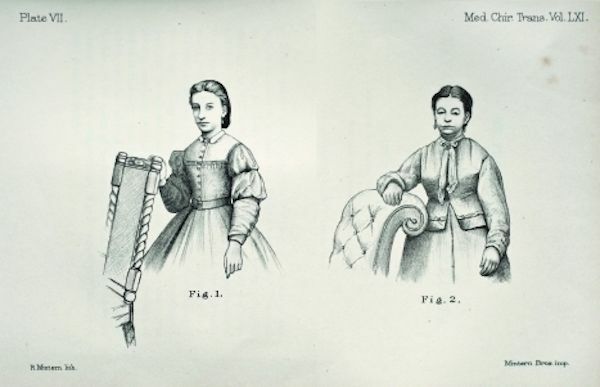 Figure 1: Patient aged 21 in 1870 before onset of symptoms. Figure 2: Seven years later with myxoedema. While researching the history of hypothyroidism to write this article, I stumbled upon the following black and white photograph of a woman with myxoedema with the description “a swelling similar to the so-called ‘fatty tumour’ of cretinism is seen in the right supra-clavicular region. 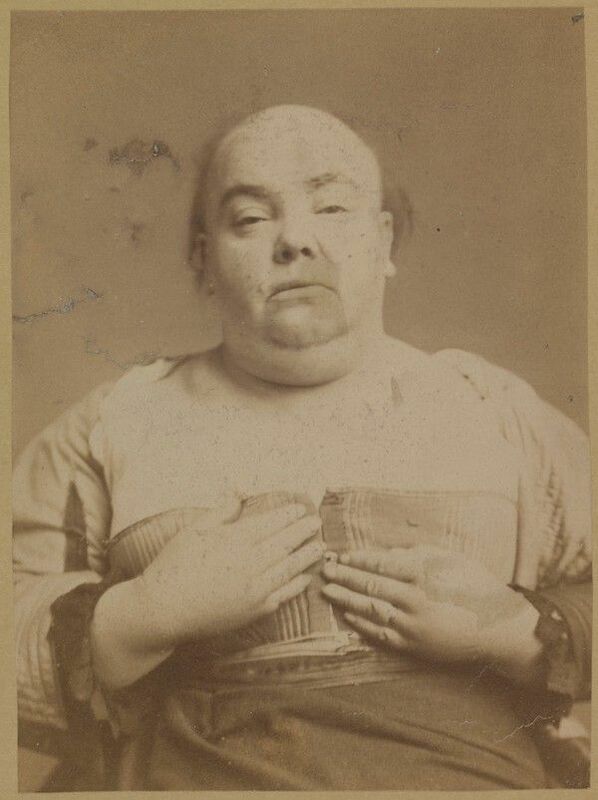 The photograph is that of a middle aged woman, seen at Leytonstone, 1885. It was taken shortly before her death.” I’ve stared at this photo so many times since first finding it thinking about how this one photograph makes so sadly obvious many of the physical symptoms of hypothyroidism. Consider the clinical symptoms included in the descriptions of Miss B and 54-year-old H.J.. Also look closely at the first photo of a woman with myxedema named H.B. and this last one taken in 1885. Yes I know they were created in the 1800s, but are these symptoms familiar to you today? I will remember the last photo of the bald, swollen woman with myxedema for the rest of my life, as I know every single person that reads this article will have that image imprinted on their brain forever. The next time you hear someone say “hypothyroidism is not serious” or “you are overweight all because you eat too much” or “your enlarged neck is just fat” or “hypothyroidism is not the reason for your hair loss”, remember this photo. 1. Gull, W.W. On a cretinoid state supervening in adult life in women. Transactions of the Clinical Society of London. 1874. 7:180-185. 2. Niedzielski, A., et al. 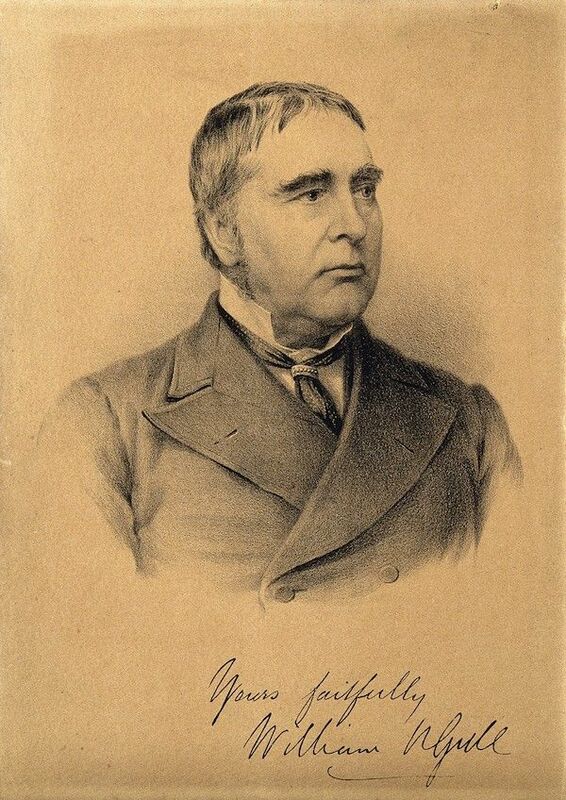 Sir William Withey Gull (1816-1890). Journal of Neurology. February 2017;264(2):419-420. 3. Pearce, J.M.S. Wir William Witten Gull (1816-1890). Eur Neurol. 2006;55:53-56. 4. Ord, W.M. On myxoedema, a term proposed to be applied to an essential condition in the “cretinoid” affection occasionally observed in middle-aged women. Medico-Chirurgical Transactions. 1878. 61:57-74. 5. Doyle, L. Myxoedema: some early reports and contributions by British authors, 1873-1898. Journal of the Royal Society of Medicine. February 1991. 84: 103-106. 6. Slater, S. The discovery of thyroid replacement therapy. Part 1: In the beginning. Journal of the Royal Society of Medicine. 1 January 2011;104(1):15-18. I’m shocked by all this and frustration is a constant. Different things as My Doctors are aware but are sorta leaving it up to Me. This is overwhelming as I’ve always been a compliant patient with all My medical history past and current documented. Failure due to the over a culmination of water weight. I now take 100 Mcq of Levoxyl, Lasix and potassium for this. I’ve had hypothyroid for 20 or so yrs. 8 of 9 siblings as well as many next generation have thyroid issues. My t3, t4 #s are ok w generic synthroid. BUT, periods of such extreme fatigue, Rheumatoid Arthritis, multiple joint replacements…what am I missing? Any suggestions? Had to go on SSD. Bless her heart – it’s hard when one moment you’re active & full of life then you’re down. Aw Christine that is so sad what happened to your mother. It is common for thyroid issues to run in families and there is a good chance her thyroid symptoms were misdiagnosed as mental health symptoms. Every part of the body including the brain needs thyroid hormone. Good to have you at Hypothyroid Mom.